To thoroughly understand the entire range of features necessary for a volleyball machine we relied heavily on the expertise of successful coaches at all levels, from young club coaches to international teams. We analyzed countless practice sessions and drills to further identify key features necessary to develop players and support the training needs of coaches. To learn more about each machine click the name of the product: Total Attack, Attack , Attack II and Skill Attack . It quickly became apparent that the sport was growing rapidly and quickly becoming much more sophisticated. With the advent of the jump serve, the game had changed; serving became a much more dominant factor. This meant that a volleyball machine intending to exactly replicate every aspect of the game had to be able to deliver servers from a high release point with considerable velocity. No longer adequate was a simple setting machine that only lobbed the ball. We concluded that while our machine needed to be able to provide a low ball release point for setting; it was imperative that it also provide a much higher above-the-net release point for exact replication of serves and spikes for digging drills. In addition, to produce an all-important jump serve, the machine had to deliver high velocity, controlled top spin and floaters that could be repeated. This would provide the much needed controlled repetition for serve-receiving drills. It was evident how important variability was to matching game-like play, so the ability to instantly change ball placement on the court was also crucial. The major problem presented was how a coach or player could easily raise or lower the throwing head while maintaining stability and easy access. This was achieved by a framework containing a platform for the operator and a tilted mast that maintains the equipment’s center of gravity within the confines of the base of the machine as the throwing head is raised. The position of the operator then becomes an integral part of the machine’s stability. Next was the need to change ball placement between throws in order to add the necessary variations found in some drills and game situations. We accomplished this through a dual-axes throwing head that allows the operator to instantly pivot the throwing head in any direction and place the ball in any desired location on the court, quickly changing between throws. This provided game tempo and realistic repetition of sets, serves, spikes and entry passes. Because of the need for spin, velocity and the elevation of the throwing head, we choose wheels to propel the ball. Wheels are compact and are the only way to efficiently impart variable spin and speed. However, an initial concern was ball wear. We addressed this in two ways. First we designed a convexed contoured wheel that uniformly distributed the contact forces, eliminating the high wear contact points. Then we developed a soft wheel gripping surface that would further reduced wear. Together, these two unique features virtually eliminated any concern of ball wear. 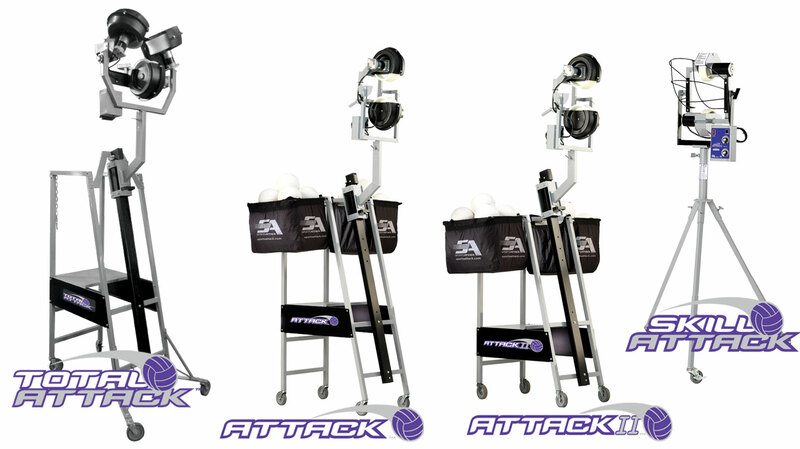 Since the introduction of the Attack, Attack II and the Skill Attack, 90% of the teams reaching the final four in college competition have used our machine as a key training tool throughout the season. Today, our volleyball equipment is standard for leading national, college, high school and club programs across the country. With our explosive growth internationally, the Attack machines have truly become the number one volleyball machine in the world. Throwing head pivots easily delivering ball to any location on the court. Spin, speed and tempo can be adjusted instantly between throws. More difficult to place ball, must move the entire machine to introduce variation. Air propelled arm will not impart a spin on ball. Realistic – elevates from 5′ to well above men’s net, over 9′ 3″. Pivots up to only 6′ (well below both men’s and women’s net height).